Connect with your experience, travel with your eyes and heart wide open. Penang Local was invited to experience a local food tour managed by Joy of Delish Asia . Joy is an energetic lady driven by the joy (no pun intended) of what she enjoys doing: introducing Penang through your taste buds. We were one of 3 travel bloggers from Italy, Sweden and Canada , excitable and adorable spirited wanderlusters , armed with cam videos, extra batteries, smart phones, eager tastebuds and the biggest smiles. It was wonderful to see them absorb all the buzz around them. We met at 9am in George Town and headed first to the Pulau Tikus market, sampling the local breakfast, fruits and vegetables. The travellers were open to sample everything offered to them, it was their first time tasting a four angled bean, it was pretty funny asking them to describe the taste. Like how would you describe a banana to someone who’s never seen or tasted one, ever !? The itinerary was planned around their taste buds, for a start, Joy found out ahead of time about their allergies, food they weren’t too keen to consume, and a simple wish list. Putting all these things together and trying to gage a traveller’s personality before you meet them is tricky, some guides do it so well. And some unfortunately, …well…the connection isn’t there. Joy does this well, marrying the simple concept of fun and experience on a food trail. Brock , Alessia and Vincent are wonderful citizens of the world. Because of their naturally warm curiosity they got a lot more out of their experience. Couple that with Joy’s flow of local knowledge and her ability to match their pace made the cultural experience so much more fun and open to spontaneity . Watch some of the videos and photos captured of our day. Below video : Brock trying to describe the four angle bean , vegetable eaten raw or cooked, popular with the locals. Traditionally eaten raw, this vegetable is believed to keep you young and beautiful. The colourful Pulau Tikus wet market, that’s Joy, founder of Delish Asia. Tasting the local fruits , the jambu batu and jambu air, our local guavas. 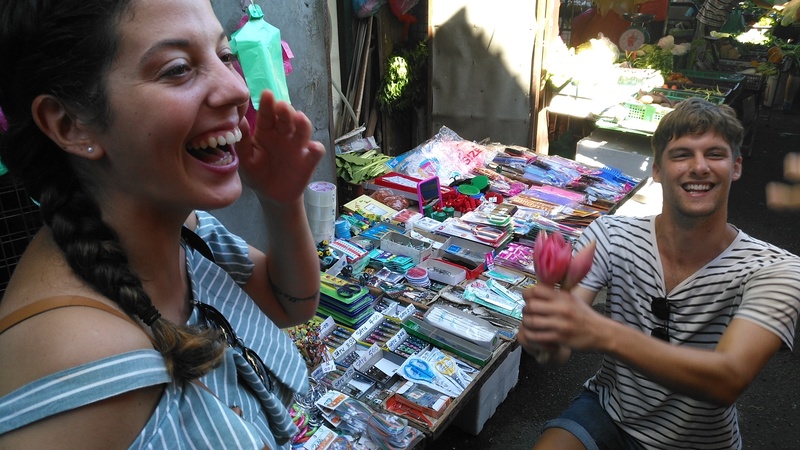 Vincent holding out the Bunga Kantan (Torch Lily) to Alessia 🙂 , sweetness in the middle of the market! We had a few Aunties laughing and smiling our way. Above video: Alessia was invited to try churning out Putu Mayung , a sweet refreshing local Indian breakfast. Joy briefs us on the history of Hameediya Restaurant, one of the oldest Muslim Indian food eatery in Penang, established since 1907. What’s yummy or good in Swedish, Vincent? Watch his reaction to tasting Putu Mayung in above clip. A tasting platter from Hameediyah, it pays to be nice, the staff and management were so taken by our friendly tourists that they laid out a special dish of samples of chicken tandoori marinates. Lastly, a clip (above) of the bloggers saying goodbye to Uncle Joe, one of the regular vendors at the market. Everyone really enjoyed the tour package created by Joy. They learnt a lot about the local culture through the traditional process and ingredients used to prepare our food. 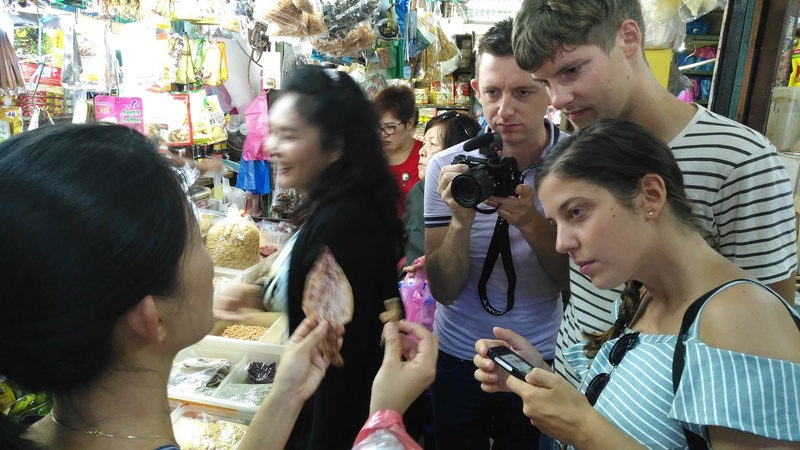 Penang is best explained by what we put in our tummies, from the herbs and spices used, vegetables or meat brewed or stir fried , a vibrant walk-through into the local market, a story comes with each activity. Culture and history is explained in a fun and ‘tasteful’ way. Food CAN bring us together. We wish Brock, Alessia, and Vincent safe and wonderful adventures ahead, they do much more than inspire travel. I think they inspire us to connect with people all over the world, and that to me is a step toward a peaceful and better world. Take a culinary journey with DelishAsia , email hello@delishasia.com or call +604 226 0853 for Joy. Follow Brock , the travel expert here. Brock’s Penang published here! And keep up with sweethearts, Alessia and Vincent and drop them a line! wooohoo! Alessia and Vincent’s youtube is up! Watch it here! Previous Post Penang’s Famous Laksa is at Air Itam (Hitam), whether you like it or not.